Love that yarn, it is so soft and pretty. I have just discovered Wendy Johnson’s sock patterns and am in the midst of waterfall. And I , too have knit my last cuff down sock. Now, tell me more about short row toes??? Sound interesting. I do short row heels, but never thought about toes, too. Lovely lovely yarn!! My next socks will be toe up. I’ve only ever done cuff down so that will be a challenge. Do you recommend any particular pattern for toe up socks? The short row toes are wonderful. Start with a provisional cast on–a crochet chain with 3 chains more that what is needed. Pick up the number of stitches needed through the bumps on the back of the chain. The cast on number is half the total number of stitches. First row is a purl. Second row starts the short rows, knit until one stitch remains, bring yarn forward, slip st to right needle. Turn work. Bring yarn forward to purl (wrapping st), sl wrapped st, purl until one st remains. Move yarn back. Sl st to right needle. Turn work. Move yarn to back (wrapping st), sl wrapped st, knit to one st before previously wrapped st. Bring yarn forward, slip st to right needle. Turn work. Bring yarn forward to purl, sl wrapped st, purl across to one st before previously wrapped st etc. Wendy has a section on short row toes. I think I’ll do a blog post with pictures. It’s very easy and makes for a toe that wears well because the wrapping reinforces the area where the toe is most likely to get worn first. Start with something simple. My first toe up socks didn’t have a design on them because I was concentrating on the construction. They were also my first knit socks. Wendy’s book is good because it goes from simple to complex patterns. Other than that, Ravelry has free patterns for beginning toe up socks. 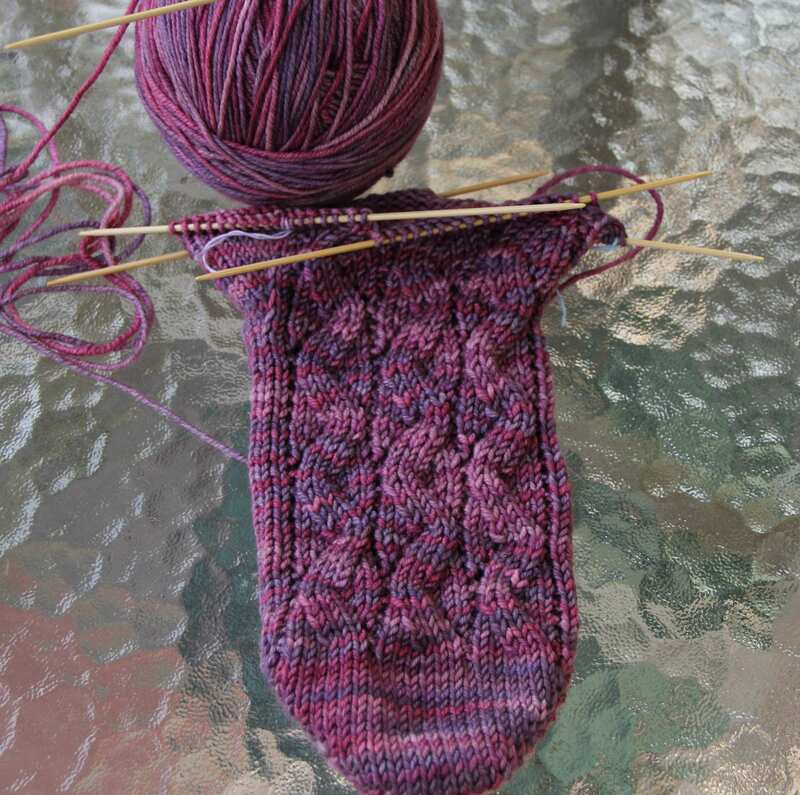 There are many ways to cast on for toe up socks but I like the short row toe the best because it provides reinforcement right where the toe is most likely to wear first. I think I’ll do a blog post about short row toes.